GCC spec SLK 280 from 2007 for AED 30,000 with a 6 cylinder engine. White convertible with red interior. It has tuner/radio and CD player. Black convertible, red on the inside with racing seats and fog lights. 10″ wheels. Imported spec grey/silver convertible, black interior with fog lights, parking sensor front and a 6 cylinder engine. 2009 Mercedes-Benz SLK 350 price AED 38,000, with air conditioning, traction control, ABS. It has red interior and is Black. Imported spec Mercedes-Benz SLK 350, grey/silver convertible with black interior. It features heated seats, 18 inch wheels and power locks. Black convertible, burgundy on the inside with rear wheel drive and premium sound system. 18″ wheels. GCC spec 2006 Mercedes-Benz SLK 280, 4 cylinders, green convertible with red interior. It comes with tuner/radio and air conditioning. Automatic Mercedes-Benz SLK 350 with 18 inch wheels, navigation system, xenon headlights, black on the outside, burgundy interior. 6 cylinder red 2012 convertible. Black interior. Airbags (front and side), 18 inch wheels and power seats with memory. 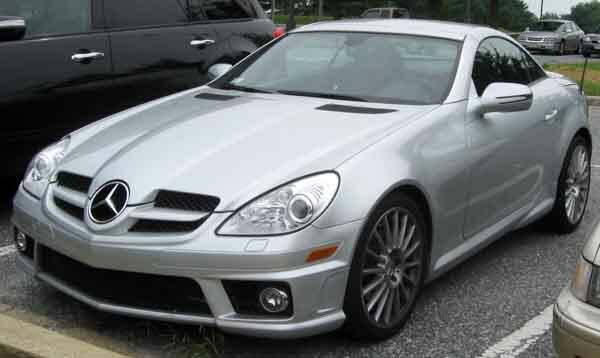 Khalifa - I own a used import SLK 350, perfect car for the UAE. Drop the roof down during the winter time, put it back up in the summer time and enjoy that cold air con. Nothing else on the road looks remotely similar and with no turbochargers attached it’s still quick. Pros: Stands out in a crowd and power. Radwan - Excellent car for the weather of Dubai. From December to March, the roof is never closed on my second hand SLK55 AMG. Can’t forget it’s got power and looks fantastic. Omar - Another owner of a pre-owned SLK 55 AMG, had to export one from the US as very few second-hand models in the UAE have the self-tinting panoramic sunroof. Drives like nothing else I've ever driven, I just wish my entire family could enjoy at the same time. Pros: Tinting sunroof, amazing handling and quick. Cons: Only a two seater. For about four months of the year, Dubai and the UAE has some incredible weather, and there is no better way to experience said weather than with a convertible sports car meaning you need to buy used Mercedes SLK in Dubai, UAE. There are so many engine options to choose from; inline-four, V6 and V8. Entry level SLK class are packed with great features and in top trims, it only gets better. Although it does have competition on the roads of the UAE, there isn’t much out there that can compare to the SLK’s looks. Newer models have got pretty good fuel economy. Only available as hardtop convertibles (no coupe models unfortunately), these cars debuted back in 1996 alongside the CLK-Class. In usual Mercedes fashion, interior, exterior and safety features are spread throughout the range 2016 models were renamed SLC effectively ended the SLK badge. Rivals on the Road include; BMW Z Series, Porsche Boxster and the Audi TT. It’s first generation; it bore a similar resemblance to the SL-Class. Complete with a long bonnet, front upfront and boxy rear end, fabric seats came as standard. Optional extras and higher trims include leather seats, power seats, cruise control and a CD player. 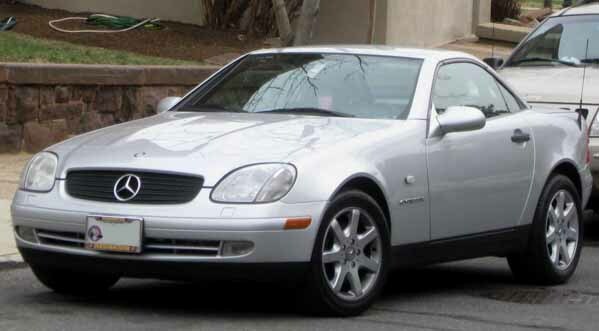 In 2000, all SLK’s received a facelift, reworked front grille, headlights, front bumper and rear lights are added. Interior features remained identical. Models in this generation include the SLK 200 powered by a 2.0-litre engine, SLK 230 Kompressor with a 2.3-litre motor and SLK 320 with a 3.2-litre V6. Power is sent to the rear wheels via a 6-speed manual or 5-speed automatic and manual gearbox. The price for a vehicle in this generation costs AED 11,000. 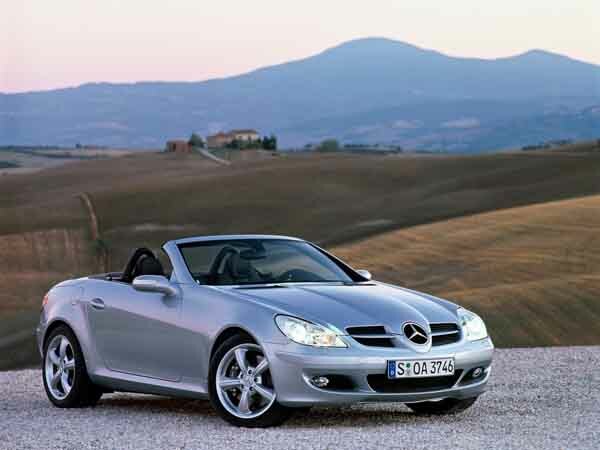 2004 saw the SLK-Class received its first major overhaul, as it moved into its second generation. Riding on a longer wheelbase, high-strength integration to the body is increased and the roof mechanism finely tuned to decrease the time it takes to retract (22 seconds compared to 25 seconds). Boot space is larger too. The cabin receives a fresh look as well and sticks with basic features such as fabric seats, basic power accessories and now a CD player. Higher trim levels and optional extras include memory seats, ventilated seats, Bluetooth and navigation. New optional extras include remote functionality for the roof and a neck heating system. From 2008 onwards, a new front bumper and wing mirrors were added. SLK 200 and SLK 350 models also have revised engines for better fuel efficiency and more power. Parking sensors, rearview camera, premium sound system, COMAND system with navigation and DVD player and additional safety options are offered. SLK 300 and SLK 55 AMG models kept their engines from the previous generation whereas the SLK 350 retains its engine but with a high output and the SLK 200 gets a 1.8-litre four-cylinder motor. Power drives the rear wheels via a 5-speed and 7-speed automatic gearbox or a 6-speed manual gearbox. Prices for these models start at AED 31,000. 2011 marked the SLK-class’ third generation. Sticking with styling cues from previous generations, a few parts are ironed out for a sleeker design as well as new headlights attached at the front. Options and extras remain similar to those of the previous generations with the addition of a sunroof with tinting properties, Magic Sky Control and matching colour roofs. Edition 1 models are available from the 2011 range; these cars feature unique badges, panoramic sunroof, AMG body and unique paint. Models include; SLK 200 equipped with either a 1.8 or 2.0-litre motor, SLK 250 with a 1.8-litre engine, SLK 300 powered by a 2.0-litre motor, SLK 350 with a 3.5-litre and the SLK 55 AMG with a hefty V8 5.5-litre powerplant. 1.8-litre and 2.0-litre engines are turbocharged in this generation, and all motors are mated to a 9-speed automatic transmission powering the rear wheels. 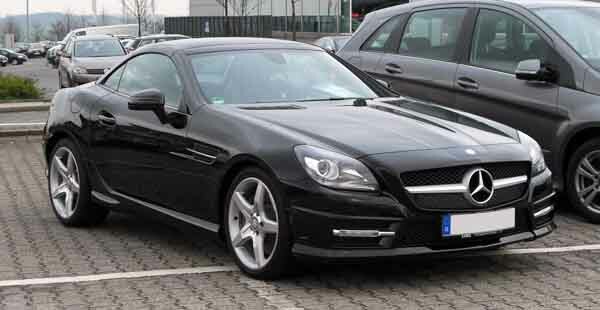 As previously mentioned, in 2016, Mercedes SLK-Class vehicles are to be rebadged as SLC models for 2017 models.